Oh did I find some AWESOME kitchen help in a Bon Appetit magazine the other day. 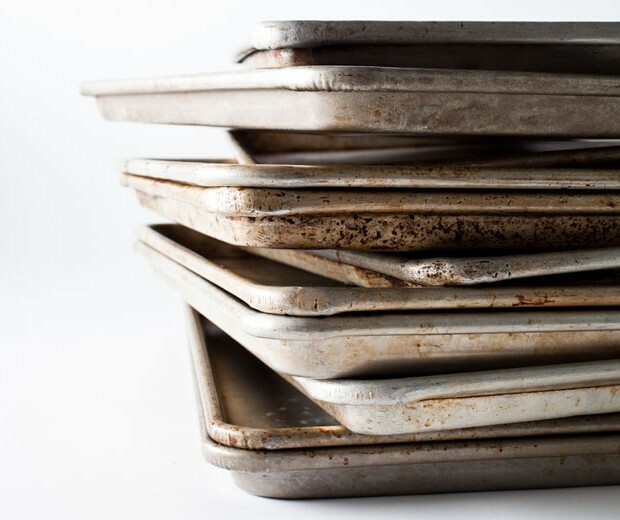 Foodie author, Rick Martinez, wrote about how we can maximize our sheet pans. The ideas he had for using these standard kitchen tools made my day. Grilled Cheese or Pressed Sandwiches. What a clever idea-never use a skillet again. You butter both sides of the sandwich and press it between two preheated sheets. This way you can make at least 6 sandwiches at a time! Vegetable Chips. Shave vegetables (potatoes, zucchini, butter-nut squash, beets, rutabaga, etc.) into thin strips or slices on a mandolin, then season them with salt and pepper and a drizzle of olive oil. Bake them at 350°F for approximately 20 minutes (maybe longer-it all depends on your oven. Check them frequently during the baking. Your goal is lightly browned, crispy-edged chips, as the photo shows. Preheat oven to 400˚. Roll out pastry on a lightly floured surface to flatten and smooth creases. Trim slightly to make clean, straight edges; cut into 16 squares or rectangles. Transfer to a parchment-lined rimmed baking sheet; brush with beaten egg and sprinkle with sugar. Coat another sheet of parchment with nonstick spray and place, oil side down, on top of pastry; top with another rimmed baking sheet. Bake until pastry is deep golden brown and puffed, 20-25 minutes. Let cool. Reduce oven temperature to 350˚. Toss apples, vinegar, vanilla, salt, ⅓ cup maple syrup, and 2 Tbsp. bourbon in a shallow 3-qt. baking dish; dot surface with butter. 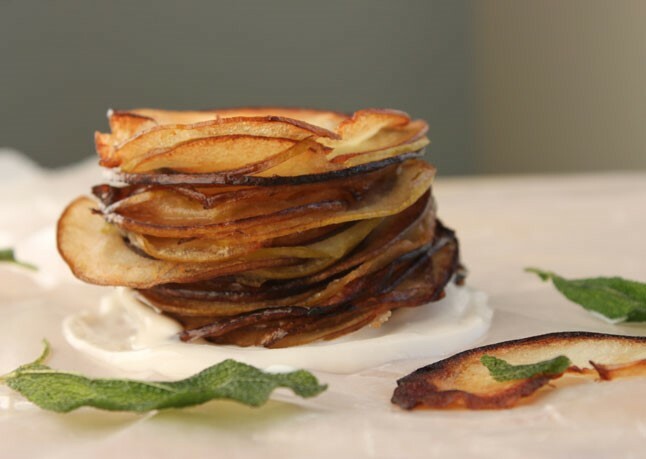 Cover tightly with foil and bake until apples soften and have released their juices, 30-35 minutes. Remove foil, baste apples with juices, and roast until apples are very tender and curled around the edges and a thin layer of juice covers the bottom of the dish, 20-25 minutes. Just before serving, whisk cream and remaining 2 Tbsp. sugar in a small bowl to medium peaks. Whisk in remaining 1 Tbsp. bourbon. Let guests assemble individual mille-feuille, topping pastry with apples, whipped cream, and a drizzle of maple syrup. 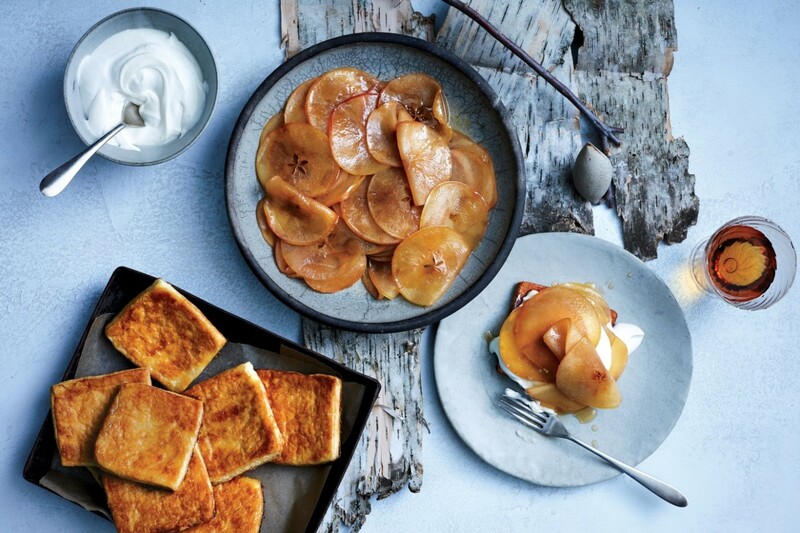 Do Ahead: Apples can be baked 2 hours ahead. Let cool; store tightly wrapped at room temperature. Gently reheat before using. Dinner Party Toast for a crowd. When wanting to make toast appetizers (toast topped with all sorts of special touches), use this approach. 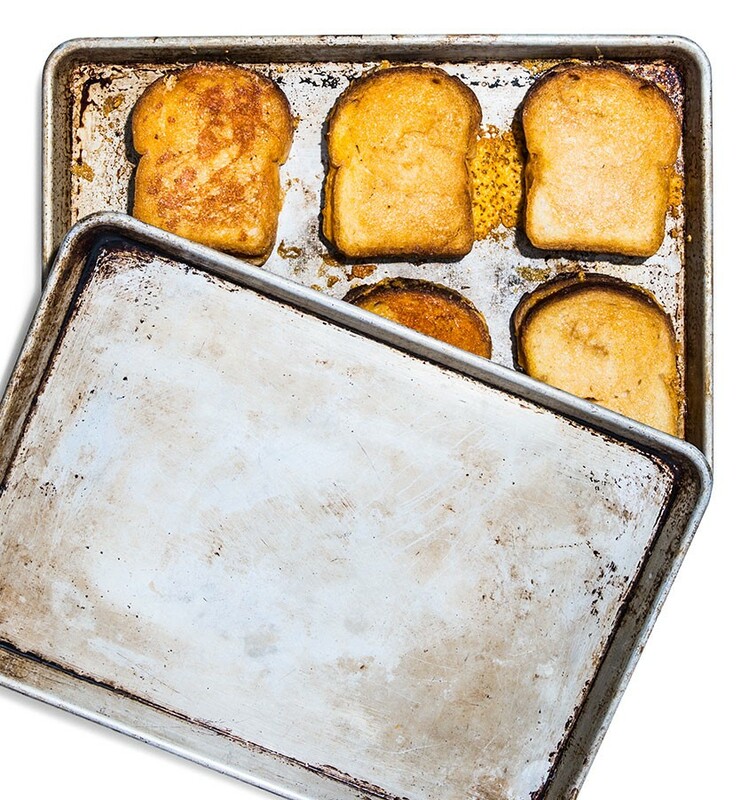 This technique magically prevents toast from drying out in the oven. 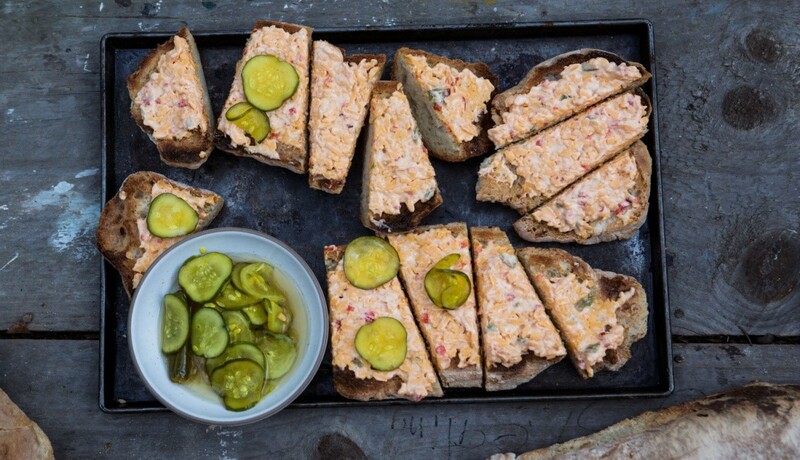 I mix a drained jar of pimento into softened cream cheese, spread it over my toast and garnish with dilled pickle slices. This is filling and very tasty. For those who like this meat thin, flat, and super crispy, this is the quickest and very best way to cook it. Once cooked, consider chopping or crumbling it atop a mixed green salad or folding it into softened cream cheese to spread atop toast (as mentioned above). And following this lead, I thought, "Why not use the same technique for cooking bacon?" I was able to lay a full pound of bacon out on my baking sheet. I topped it with another sheet and baked the bacon at 350°F for approximately 20 minutes. The top and bottom heating surfaces cooked everything so evenly! If you try this, be sure to watch your bacon so it doesn't over-cook (oven temperatures can vary a lot). I immediately transferred the bacon to another pan lined with paper towels to absorb the extra fat. By the way, cooking all your bacon at once is a good way to save time. 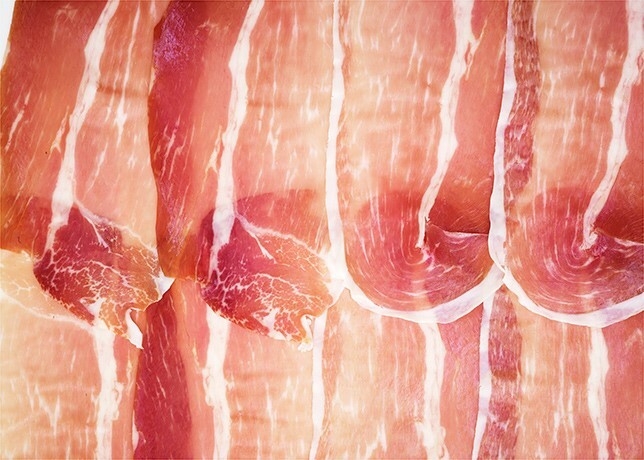 Keep the extra in an airtight container in the fridge, and you always have bacon ready for your omelets and BLTs.